The Fairhope City Council approved a resolution on Monday authorizing Mayor Tim Kant to accept a $618,585 grant through the Federal Aviation Administration (FAA) for improvements at the H.L. Sonny Callahan Airport. Fairhope Airport Authority Chairman Chuck Zunk said the funds will help pay for approximately $680,000 in improvements at the airport, including the construction of an apron near the east terminal as well as grading and drainage improvements at the west terminal. The FAA grant covers 90 percent of the project, with the Airport Authority and a $34,366 grant from the Alabama Department of Transportation Aeronautics division covering 5 percent each. Zunk also said three private companies will be making more than $3 million in improvements on the west side of the airport. One company’s portion will fund improvements to the north hangar, while the other companies will build individual, private hangars for jets. The council also approved two appointments to the Airport Authority, one of which will fill the vacancy left by Zunk, who recently announced his retirement. Mayor Tim Kant commended Zunk on his work with the Airport Authority for the last nine years. Kant said Zunk was instrumental in helping the city to change what was just a city committee into the Airport Authority, which he said can now be run like a business. The City Council appointed Vince Boothe to complete Zunk’s term, and appointed Tom Scheck to complete the term of Rodd Plat — both of which will expire in March of 2017. The City Council also made three appointments to the Personnel Board. 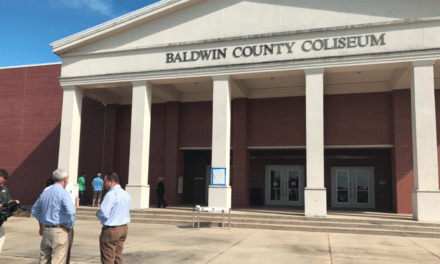 Robert Stankoski will fill the unexpired term left when his brother, Clark Stankoski, was sworn in as a Baldwin County District Court Judge. Robert Stankoski’s term will end in December of 2017. Other Personnel Board appointments included Lorenzo Howard, who will fill the unexpired term of Judy Hale, which ends in December of 2016, and Jenny Erdos, whose term will last until December of 2019. The City Council also appointed Brad Summersell to a vacant position on the Education Advisory Committee. Also approved was a resolution to authorize the submission of pre-application documents related to a $100,000 Recreational Trails Program (RTP) grant through the Alabama Department of Economic and Community Affairs. That proposal aims to install an 8-foot wide, 1.5-mile asphalt walking trail at the city’s new soccer complex, which is currently under construction on Manley Road. The grant will fund 80 percent of the project’s estimated $125,000 cost. The additional $25,000 is expected to be matched by the city. Stacy McKean, the city’s grant-writing consultant, said the resolution authorized the city to submit a pre-application for the grant, which is due by July 31. She said the city hopes to receive approval from ADECA in August to submit a full application.